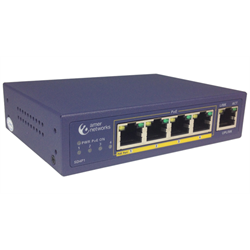 Designed for use with Power over Ethernet (PoE) devices, the SD4P1 switch provides up to 15.4W of power to 802.af PoE compatible devices connected to the switch’s PoE ports. The Switch allows these devices to draw power from the switch and remove the need for a power adapter. Some devices that may have support for 802.3af are Wireless Access Points, IP Phones and IP Cameras. The Switch’s ports automatically negotiate between 10BASE-T and 100BASE-TX network speeds, as well as between full and half duplex modes, so any port can connect to a Fast Ethernet or Ethernet network. The ports also support Auto MDIX, allowing the automatic detection of a straight through or cross-over cable, this feature reduces support problems commonly caused by incorrect cable usage.